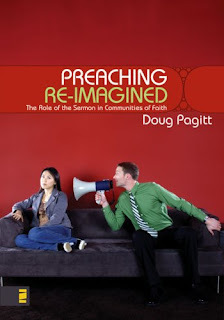 This is the first book I've read by Doug Pagitt, who is the pastor of Solomon's Porch in Minneapolis, MN. It had been sitting on my shelves for a few years and I finally got around to reading it! I was intrigued by the title and thought I was about to encounter the thoughts of a pastor who had something new to offer, methodologically, to those who preach to communities of faith on a weekly basis. As I've said before, I think that the material presented in the one-man monologue must be supplemented with various modes of interaction (question, dialogue, experiences, etc.) for it to be understood and assimilated into the life of a person or a people. 2) offer some practical tips to include interaction as a key element of a sermon. But he didn't really do either of those. Instead he offered advice on listening to the hopes, fears, questions, and concerns of church members; and then including those in the sermon for the week. That's not bad, it just means that the title (in my opinion) was a bit misleading. "I talk for awhile, then I invite others to comment, ask questions, offer clarifications, and so on. If I've done my job, people are thinking and talking about faith issues in a new way, and that thinking will lead them to new considerations" (p. 199). Most preaching pastors that I know would consider "having done their job" by the same standard, so I fail to see how this lives up to the title of "Preaching Re-Imagined." "[The] whole point of preaching is to help people grow in their understanding of God and how we are to live as God's people and to empower the church to live out God's mission" (p. 162). Once again, I'm not sensing where I need to invoke my imagination to picture that kind of preaching. I don't think that Pagitt is off-base in these two quotes, I simply think that the title over-promises and under-delivers (which is probably more the fault of the publisher than the author). In the end, all he's really done with this book is to encourage church attenders to practice active-listening skills and preachers to be involved in (or at least aware of) the day-to-day lives of people. * "The good news [gospel] is not informational" (p. 103). * "People's lives are not changed by the information they get" (p. 163). * Information changes people's lives - for instance, my live was drastically altered when my wife told me the news that she was pregnant. 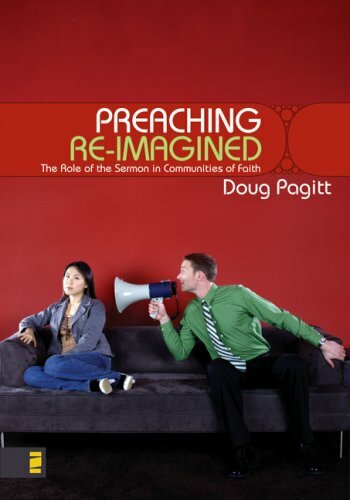 * I'm curious how Pagitt can write a book full of information, which seeks to change the way pastors prepare/deliver sermons, when he doesn't actually think that information changes people's lives.